New York style hard aged cheddar, blended with black olive and roasted sweet red peppers. 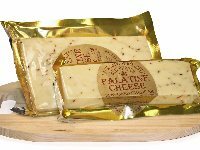 New York style hard aged cheddar blended with black olive and roasted sweet red peppers. This cheese is a superior handmade cheddar, firm texture, deep cheddar flavor accentuated by the crisp black olive and savory marinated sweet red pepper. Available in both gold bar size (approx.. ½ lb). and ½ lb. pieces.